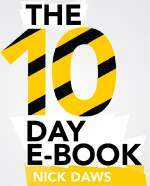 The 10 Day Ebook promises to get your ebook from idea to published and earning money in 10 days. Surprisingly, the answer is yes. With the proviso that you shouldn’t be a perfectionist and that you don’t let yourself suffer from too much analysis. I’ve read quite a few different products similar to the 10 Day Ebook that claim to be able to get your ebook written and published in record time but this is the first one I’ve felt confident enough to actually review. You’ve probably come across this kind of promise before – computing books that promise you’ll learn scary things like PHP in 24 hours or language books that claim you’ll speak French in a week. In most cases the reality is “dream on”. So it’s refreshing to read something that is actually realistic. This entry was posted in Internet Marketing and tagged 10 day ebook, ebook writing, Internet Marketing on May 1, 2010 by Help Answer.